J R Turek has been named WWBA 2019 Long Island Poet of the Year! 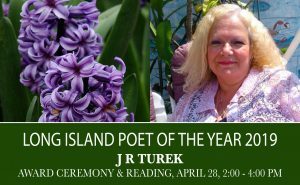 Award Ceremony and Poetry Reading by J R Turek will be held on April 28, 2019, 2:00 – 4:00 pm at the Birthplace. J R Turek is an internationally published poet, editor, and workshop leader. She has been the recipient of two Pushcart nominations and Proclamations for her dedication to Poetry from Nassau County, Suffolk County, the New York State Senate, and the New York State Assembly. Turek was named Bards Laureate from 2013-2015, NYS Woman of Distinction in 2017, and Winner of the Village of Great Neck Poetry Contest in 2018. J R is a Council Member for The Bards Initiative, host for Performance Poets Association, and Board Member for The North Sea Poetry Scene (TNSPS), Princess Ronkonkoma Productions (PRP), and Performance Poets Association (PPA). She has been editor of The Bards Initiative’s Annual Anthology, co-editor of Whispers and Shouts, Max Wheat’s Young Voices Children’s Anthology, and Moderator of the Creative Writing Group in Farmingdale for 22 years. J R Turek is the author of four full-length poetry collections: A is for Almost Anything, Imagistics, They Come And They Go, and B is for Betwixt and Between. Her work has been translated into Korean, Romanian, French, and Italian. J R, the Purple Poet, is a lifetime Long Islander who resides in East Meadow with her soul-mate husband, her dogs, and her extraordinarily extensive shoe collection. She has been a “poem-a-dayer” for over 15 years.